There’s something about a Sunday night outside. There’s something even more special about a Sunday night outside when your daughter says she has a surprise in store for you. She grabs your phone and puts on There’s Something Special from Despicable Me 3. The lyrics, “there’s something special on the other side of this moment,” brings a tear to your eye as she comes to your side to hold your hand. In my mind, the special moment is happening now. She sways and sings with you for a minute before she releases and runs off. The moments are fleeting at times, but you still smile. 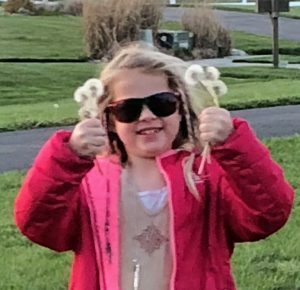 She runs back to you with six dandelions in her hands. “Let’s make a special wish, Mom,” she says and the moment now has you holding back tears from behind your sunglasses. We each made two separate wishes and two in unison. The power of a spirit animal is meant to depict a member of the animal kingdom that embodies and conveys your natural, wild soul. It also happens to be mentioned in a show Kelsey has been fond of recently. The title is Alexa and Katie and the series depicts two best friends, one battling cancer as a teenager. The show actually helps Kelsey feel better as she watches the struggles of these fictional characters. Though they are in High School, Kelsey finds a connection in each episode. Thus, when we walked into Build A Bear for a birthday party recently, the struggle to select a furry companion was real. She contemplated and debated. She paced and wandered. 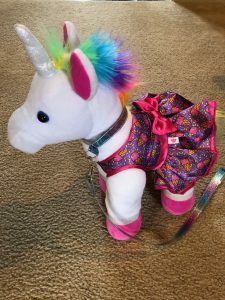 She almost selected the colorful, rainbow bear like most of the other girls. And then, she saw the one. Though her imagination astounds me, I truly see the reflection. 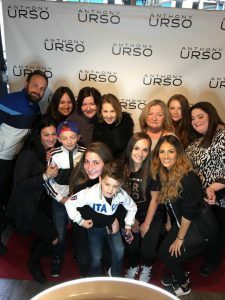 When Anthony Urso and the Almoras join forces for a Pop Up charity event to celebrate Chicago the Chicago Cubs all while supporting Kelsey’s Kaleidoscope, Inc., the president jumps on a plane to attend the festivities. We cannot thank Anthony Urso enough along with Albert and Krystal Almora for their support and generosity. The clothing is incredible, the company is fantastic, and the support was overwhelming. 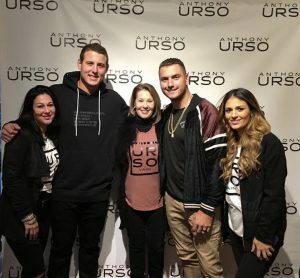 Anthony Rizzo, Albert Almora, Jr, and Krystal Almora pose with President, Mary Wagner, and Elizabeth Gregorio. Anthony Urso and President, Mary Wagner. Picture a day of quality time in the happiest place on Earth. You see smiling faces and a little bit of magic awaits you around every corner. As grateful and happy as I was to spend time in this land of happiness, I could not escape a hint of sadness as my seven year old could not take it. Sensory sensitivity is becoming apparent in various ways and there was certainly a great deal of that happening at every turn. The standing, the walking, and the lines were just too much for her to take. Though she looked the part in every way, her body told her it was on overload. We found many magical things to do while waiting for her brother to ride and explore with sheer delight. We took a much slower pace and took many breaks. While we waited, Make a Wish kids and others who were also facing a challenge passed by us. For those children and my own daughter, I struggled at times to face a cold, hard fact. My child could not experience this trip like many other children her age do. Her legs could not handle the walking and the weight of her on my back more times than expected was just a realization that careful considerations and thought must go into every thing for Kelsey; happy times included. 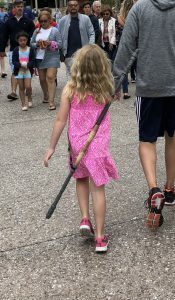 In the end, she found a heroine in Star Wars’ Rey and there was one souvenir she just had to have. Holding her father’s hand at a point when she felt strong and confident, she strolled with pride. Whatever It Takes. For you. Always.